Non-fiction, special interest or documentary films on Bangladesh made by non-Bangladeshi filmmakers covered issues like micro finance, climate change, poverty, population, prostitution, child labor, ready-made garment, women, intermarriage, ship breaking, travel etc. Still there are hundreds of real stories on various subjects are waiting to be told. Very slowly some independent Bangladeshi film makers started making documentary films, although the numbers are painfully low and limited. Most documentaries made on Bangladesh related issues were made for foreign televisions, international organizations, general audiences and they were shown outside of Bangladesh. Nine films are included in this list of documentary films on Bangladesh. As mentioned earlier, the list of the doc are all created by non-Bangladeshi documentary makers. Some are feature-length, some are short, some are old, some new, some available, some not, some won award, some just there. This list is an effort to keep a record of them. Previous lists can be found here – Part 1, Part 2, Part 3, Part 4, Part 5, Part 6, Part 7 and Part 8. 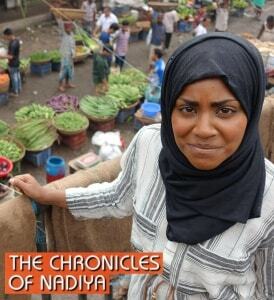 Two-part series in which The Great British Bake Off 2015 winner Nadiya Hussain explores the recipes that have shaped her love of cooking. Part 1: Nadiya Hussain visits her family village near Sylhet in the north east of the Bangladesh. Using local produce and techniques she shares her favorite recipes, including baked fish with green mango chutney and a halva called thoosha shinni. As she cooks she reveals the roots of Bangladeshi cuisine. When she is invited to a relative’s wedding, Nadiya decides to bake a three-tiered pumpkin celebration cake for the bride. It is a decision she may have thought twice about if she had realized the only available oven would be in an industrial bakery. This trip is also a chance to reconnect with family Nadiya has not seen since her own arranged marriage over ten years ago, and it proves to be a moving trip down memory lane. Part 2: After spending a week with her family in Sylhet, Nadiya cooks her way around Bangladesh and learns more about the country, its people and its food. In the capital city Dhaka, the Great British Bake Off winner spends time with a charity that delivers school meals to deprived children, before learning about an ancient fishing method in a small Hindu village on the banks of the Padma. As her journey continues, she meets and learns from food entrepreneurs and experiences a side of modern Bangladesh she never knew existed. Thirty Million examines the threat posed to the people of Bangladesh by rising sea levels. The country is considered the most vulnerable in the world to climate change, and is predicted to lose 17 per cent of its land by the end of the century, displacing 30 million people. The documentary was made to give the people of Bangladesh a voice and to show people in the West how what happens there will affect people here. According to film makers, the amount of people who could be affected is almost 10 times the amount of people who have fled Syria during its crisis, and the issue has been tagged by the Pentagon as “a major threat to global security and peace.” The film was funded by the United Nations Development Program and the Global Environment Facility. A Two-Part Series for PBS on microcredit and microenterprise development. To Our Credit explores an exciting new strategy to combat poverty: microcredit, known in America as microenterprise development. It is the practice of extending small loans and other support to low-income people to help them create their own employment. Microcredit is a dramatic departure from traditional charity or welfare programs: money is loaned, not given; repayment is required; interest is charged. In a world where capital is king, the effect can be remarkable. Part One: Bootstrap Banking and the World profiles microcredit with stories from Bangladesh, South Africa, Bolivia and India. Within the past decade, 15 million people have received microloans. Part Two: Bootstrap Banking in America profiles microenterprise development in New England, Arkansas, South Dakota and Chicago. 300 U.S. organizations now provide loans and training to microbusinesses. Micro credit – small loans administered with no collateral requirement – might represent the most powerful weapon in the fight against global poverty. But is micro credit a sustainable solution? This program follows up on the 1995 documentary ‘The Women’s Bank of Bangladesh’ which examined Bangladesh’s Grameen Bank, a pioneering micro credit provider focused mainly on struggling women. Small Change, Big Business revisits loan recipients a decade later, studying the long-term effects of micro credit in their households and in their Islamic community. The documentary also interviews Grameen bank founder Muhammad Yunus, who sheds further light on the bank’s methods and goals. Portions are in Bangla with English subtitles. King for a Day is the diary of a cynical Bangladeshi journalist as he follows the arrangements for the arrival of President Bill Clinton in March 2000, the growing tension, the demonstrations, the disappointments, whilst he tries to find out what the common man really feels about President Clinton’s visit. 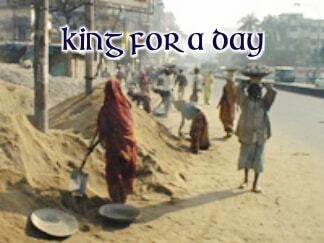 King for a Day is a satire on globalization and its implications for the citizens of developing nations. When the president of the world’s wealthiest nation decides to spend 12 hours in the capital of one of the world’s poorest nations, the build up to the visit is perhaps far more important than the day itself. 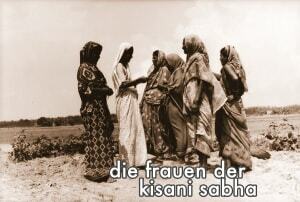 Die Frauen der Kisani Sabha (The Women of Kisani Sabha) is a documentary about landless women of Bangladesh. Landless women in the Southern part of Bangladesh have organized themselves in a grassroots’ organization called the Kisani Sabha. They have occupied more than twenty chars, alluvial islands in the Tetulia river. They live together with their families. Their enemies, a coalition of influential land brokers and large landowners, regularly send their musclemen in order to terrorize and expel the people from the chars. The eyes of the Kisani Sabha women light up as they narrate how they have used brooms, sticks, sharpened arrows and bullets made from burned mud, forcing the enemies to take to their heels. The women fight in front – men have to stand behind. We met women who spoke openly and with courage, voicing incisive and intelligent criticisms of a government which ignores their concerns. In moving images, they told the story of their life on the chars – under a wide open sky in the river. The longer version of this doc is 82 mins. 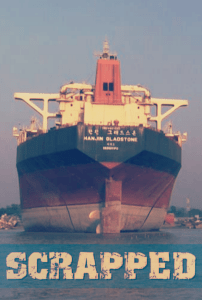 Chittagong is Bangladesh’s second largest city and the heart of the country’s lucrative ship breaking industry. Russia Today investigates appalling working conditions and human rights violations in the ship breaking yards. With no health and safety provisions or proper training, employees are constantly at risk of serious injury and even death. 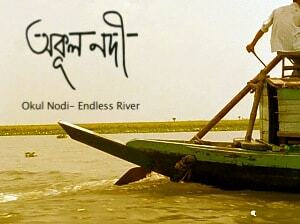 A documentary on the Munda people living in the south of Bangladesh, bordering the forest of the Sundarbans. At the edge of the Sunderbans forest in Bangladesh, inhabited by the royal Bengal tiger, it is a tribal group imported from India about 200 years ago to clearing the forest and cultivable land. Over the years the lands that were allocated to them in exchange for hard work ended up in the hands of the Hindu and Muslim neighbors, so the Munda survive in very precarious conditions including the threat of the tiger that sometimes assails their villages. Bangalees who view them as uncivilized. In the last twenty years the shrimp farms have taken the place of rice, severely damaging the local ecosystem. Since 2003, their living conditions have improved thanks to an Italian missionary, Father Luigi Paggi, who with the help of the only graduate of the tribe launched few schools, built five new villages after the cyclone Aila in 2009 and gave education to several girls saving them from early marriage, which often end with the death of the first child and the mother. 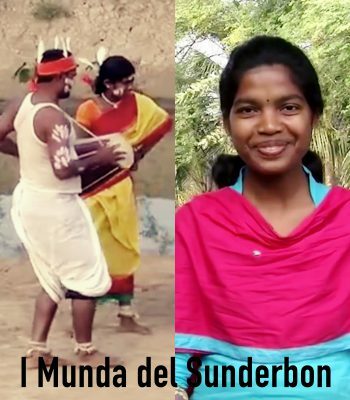 These girls are educated and willing to fight for a better future, along with several youth of the tribe who are proudly rediscovering their culture, are a sign of hope for the Sundarban Munda and beyond. nice documentary any one should watch it.